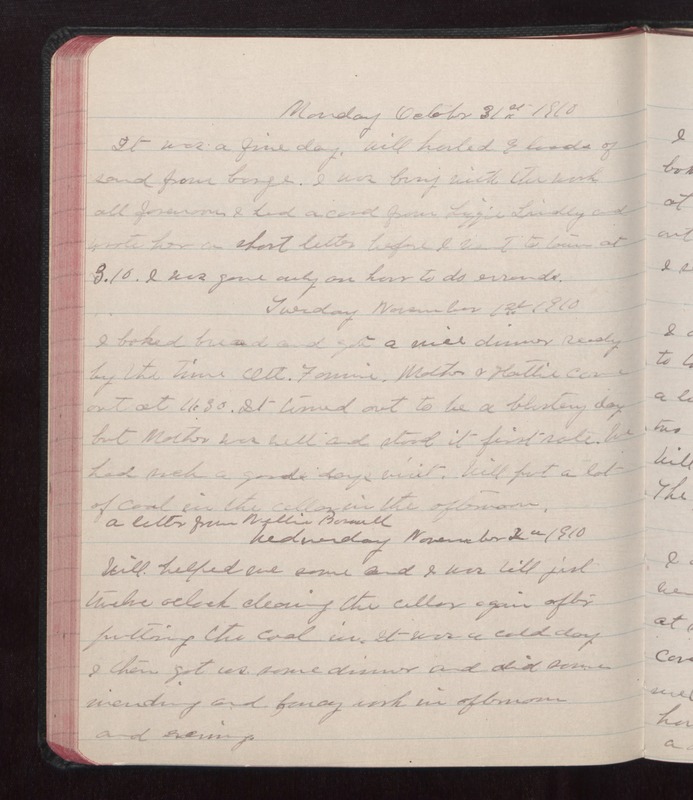 Monday October 31 1910 It was a fine day. Will hauled 9 loads of sand from barge. I was busy with the work all forenoon I had a card from Lizzie Lindley and wrote her a short letter before I went to town at 3.10. I was gone only an hour to do errands. Tuesday November 1st 1910 I baked bread and got a nice dinner ready by the time Ott, Fannie, Mother & Hattie came out at 11.30. It turned out to be a blustery day but Mother was well and stood it first-rate. We had such a good days visit. Will put a lot of coal in the cellar in the afternoon. A letter from Nellie [Burwell?] Wednesday November 2 1910 Will helped me some and I was till just twelve oclock cleaning the cellar again after putting the coal in. It was a cold day I then got us some dinner and did some mending and fancy work in afternoon and evening.